There hasn’t been a lot of optimism coming out of the RIM offices lately. Besides revealing that they’d be cutting 11% of their employees last week, RIM has been trying to weather an administrative shakeup and a nixing of their release of a 10-inch tablet. Today however, sees some optimistic news courtesy of RIM, though it kind of seems like a roll of paper towels tossed into the ocean when compared to the past few weeks. Nevertheless, Blackberry Messenger, one of Blackberry’s more reliable, socially-chic features has been blessed with an update. BBM 6’s most practical new feature is its ability to function within other running apps, allowing real-time interaction between BBM users. 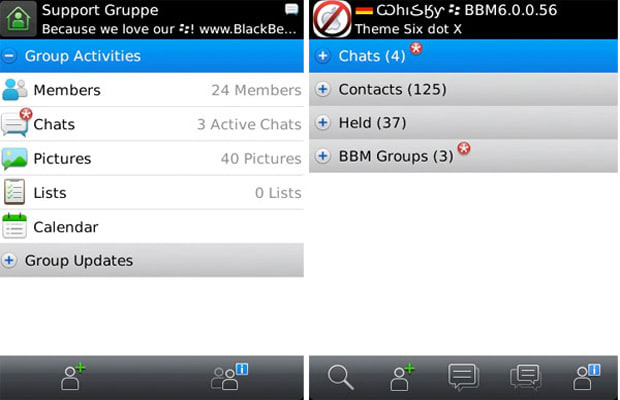 BBM users can also see what type of apps their BBM friends enjoy most. Now the recently-axed RIM employee can break the news to their spouse over a game of Angry Birds.